Those obsessed with so-called experts should thank their lucky stars that Wikipedia does not have an article about Pet Jesus. 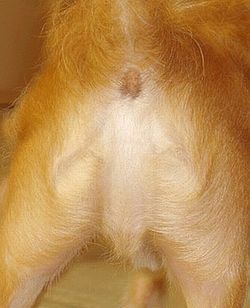 As opposed to seeing Jesus in your pet. 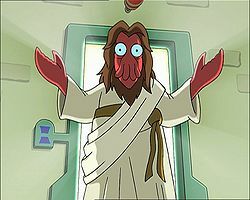 Pet Jesus© is the brand name of Artemisia messianica, a small branchiopod crustacean native to the Dead Sea. Its larvae have the capacity of turning into dry spores in the process known as 40 days fast, in this manner surviving for great periods without air, food or water. In this state it has been marketed as a toy since the 50's by Metaphysical Experiences, a company owned by the Vatican Bank and Jim Jones holding. Pet Jesus are sold in boxes containing sequential paper packs and The Holy Book of Instructions that explains how reproduce the life cycle of the animal. Basic kits are restricted to this, it's for the owner to find a suitable place to develop the colony, as a sterilized mayonnaise pot. Deluxe kits include the vivarium itself with several different sets of well-crafted miniatures such as crosses, Roman soldiers, possessed pigs, zombie Lazarus, The Temple of Solomon and so on. In 1963, the Very, Very Local District Court of Nebraska opened a collective lawsuit against Metaphysical Experiences. The plaintiff party accused the company was infringing the laws against deceptive advertising by just 'promising miracles', luring kids into believing that they were buying a very exciting pet by the fanciful cartoonish pictures in Pet Jesii kits (see above) as well the overly optimistic slogans such as "Letting you play God", "Raise a Pet Jesus family and you will be a believer" or "The miracle of instant supernatural life". The claimants sustained that all that kids could get from an M.E. kit was a tasteless shrimp-like creature that roamed witlessly over the sands of the vivarium, babbling incoherent middle-English nonsense - this if the kid was lucky, as most of the kits ended up as a jar of brownish ooze due the complexity of the purification process (see below). The action was lifted when the defenders brought to the court that the claimants were just a bunch of Atheists and Wiccans, by Nebraskan laws of the time, their testimony being worth only 1/7 of a W.A.S.P. and 5/4 of a coloured person. 1:2: "Pet Jesii are ascetic desert dwelling animals that require just a tiny strip of sand and a handful of rocks to reproduce their natural environment. If thou followest these instructions faithfully, I will reward thee with plenty of fun. 1:3: In the beginning, thou shalt set up the vivarium. Findest any compatibly sized receptacle of glass material and cleanse it from the presence of evil bacteria by immersing it in boiling water for about 3 minutes. Remember: The Lord don't like kids that play with fire: thou shalt call an adult person to operate the stove. 1:4: Be sure to carve a little depression in the sand and fill it with salt water, or else the savior couldth not perform the prized 'walking on the water' trick. 1:5: After setting up the terrarium, thou shalt pour the #1 - Purifier Package. With a magnifying glass, thou canst even see the little Jews and John the Baptist hatching instantly. 1:6: Thou shalt wait two days and two nights and then pour the #2 - Instant Apostles pack. 1:7: Thou shalt wait again 3 more hours and finally pour the #777 - His Own Pack. After Pet Jesus is baptized, thou shalt remove the now obsolete John the Baptist's head to add space for preaching. 1:8: Now thou shalt add the #4 - Kosher food pack containing one fish and one loaf of bread. Thou shalt not worry, for he who worrieth hath no pleasure: Pet Jesus will multiply the food for the rest of the vivarium. 1:9: For now on thou canst rest and enjoy the wonders of Christendom. Thou willst have 3 years of fun before the crucifixon, and 40 more days between the Resurrection and the Ascension. 1:10: Remember: NEVER try to prevent the Ascension by blocking the top of the vivarium. This is dishonest, heretical, un-ecological and can make Me really pissed off - and when I'm pissed, I can be really wild, just ask Noah and Job... Thou shalt ask thy daddy for a new kit, o kid of poor faith!". 3/1000 drams of Wine (don't use water expecting Pet Jesus to turn it for you - the spurt of miracle can make it tiresome and unsuitable for reproduction). Just place the ingredients in the vivarium while playing the CD. You may have a brand new apocryph Messiah descendant hatching soon but don't expect Him to replace the original Pet Jesus as He will not be followed by the ancestor's apostles. You may buy a 'Knights Templars' package instead to provide some adepts to your A.M.D. My Jesus does not perform miracles! Probably there is something disturbing the environment of the vivarium. Try to keep it from excess moisture. Monotheistic prophets require desert climates to prosper. You must remember that faith is also an important external factor for the miracle phenomena to happen. I personally have never seen a P.J. miracle, but once I knew one person that knew another person that had a cousin that witnessed lots of P.J. 's miracles. Seriously! My Jesus didn't rise from the dead! Don't worry, your P.J. is probably just resting. Did you wait more than 48 hours? It usually takes between 48 to 72 hours for a dead P.J. to rise again. If your P.J. still fails to resurrect - not that this has ever happened, just as a hypothetical situation - contact us immediately and don't tell your neighbors. In any case, as stated above, while buying a P.J. kit you have agreed that warranty voids in case of lack of faith. Absolutely not! Pet Jesii are naturally asexual hippy animals and in normal conditions should never hump on people's legs or display aggressive behavior. By neutering them you can just make them fatten, and a fat crucified Jesus is kind of a bad view. Small crustacean jaws are too weak to damage human skin. It's more likely that you have been flogged - a common behavior of this kind of animal. Whip of cords is a little organ that P.J. uses against Its natural enemies - so maybe your P.J. has confused you with a seller of the Temple. Before playing with Pet Jesus take your necklace off and wash your hands if you have dealt with money. Don't worry. When Pet Jesus is eaten, this starts the process known as reverse transubstantiation. When reaching one's stomach P.J. 's flesh turns into bread and Its blood turns into wine. In low quantities, this would be harmless to children, but don't encourage this behavior in any way as it can lead to early alcoholism. 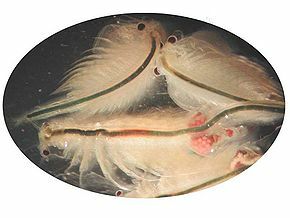 For those without comedic tastes, the so-called experts at Wikipedia have an article about Sea Monkeys. If you are confused about which one you want to know to know to know to know it is it is yes. babs, it's probably Original Jesus. This article was nominated to become a featured article; however, due to several votes being devoured by an Isomorphism elemental, it didn't make the cut (8/16). Don't let this happen again! For just pennies a day, you can prevent another travesty of this nature, or vote for other articles at Uncyclopedia:VFH. This page was last edited on 30 August 2012, at 08:43.